NBA Hall of Fame guard known as "Mr. Clutch." He won an NBA Championship with the Los Angeles Lakers in 1972 and was named NBA Finals MVP for the Lakers in 1969 despite the team losing to the Boston Celtics in seven games. His silhouette became the image for the NBA logo. 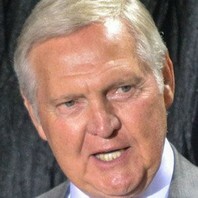 How much is Jerry West worth?